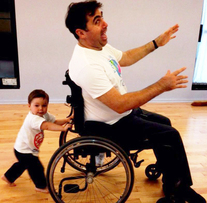 Accessible Yoga Blog: Where did you teach? Who was the population? David: I taught at two studios in the Roncesvalles neighborhood in Toronto. The populations were mostly millenials who were able-bodied, though everyone struggled with regulating their stress levels and their mental health. I’ve also done some teaching through the University Health Network at Mount Sinai hospital for the hospital staff. David: A couple years ago when I was teaching a large group class, an older woman injured her back in a mild pose. She was quite distressed. I approached her and tended to her injury and worry in a supportive way that also helped everyone in the class to enter into the moment as a collective experience. My response surprised me because inside I felt the urge to panic, but a different instinct took over. I also used the moment to deepen the sense of safety in the group. The moment showed me that I could trust myself to respond as a teacher to handle whatever might show up. David: While I didn’t specifically teach people with mental health challenges, that tended to be my approach to teaching, because that has been my struggle. The more subtle aspects of practice that help people to regulate their stress levels and sensitivities tended to be what I emphasized. Accessible Yoga Blog: Which subtle aspects? David: Slowing down and really savoring what it’s like to move with your body and breath rather than having aspirations. Also, appreciating a subtle sense of infusing an anxious state with groundedness simply by paying attention to the feeling of the breath. David: I am excited to work more directly with people who struggle with more pronounced mental and physical health challenges. I am on hiatus from yoga teaching as I’m finishing my studies as a massage therapist. I recently had outreach experiences working with clients with cerebral palsy and AIDS. I was trying to get them to be aware of the subtle and gross sensations of their bodies and breathing as I provided massage to them. The experience really held a mirror up to me. Not in terms of those particular struggles, but the similarities to my own struggle with deep mental health challenges and the way in which yoga empowered me in my life. Accessible Yoga Blog: Does yoga continue to empower you? David: Yes, it still helps me ground myself in the sensations of my body and breath. A “simple practice” that has been a life raft for me in troubling states and life experiences. David Rendall began practicing yoga asana and meditation in 2003 at age 17 to ease his depression and anxiety. In 2013, he completed his training at Downward Dog in Toronto and has since taught at Yoga Star, Yoga Village & Mount Sinai Hospital. David teaches slowed-down, gentler, student-centered versions of the traditional ashṭaṅga-vinyāsa sequences and restorative hatha postures. He holds a safe and thoughtfully-sequenced space, guiding students towards inner exploration, balance and integration. 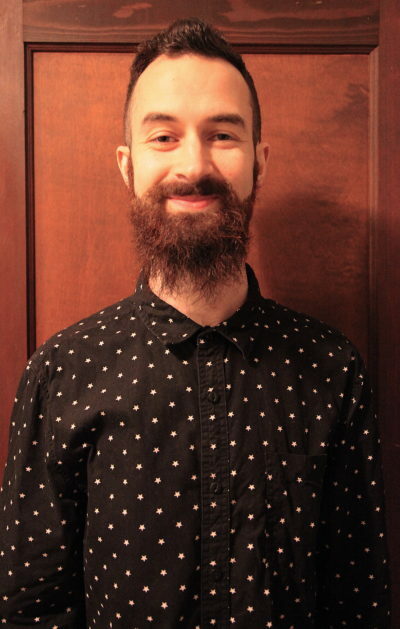 David serves as a mental health advocate through public speaking, writing, and visual art – www.frameofmind.blog. He is currently finishing his studies as a massage therapist at Kikkawa College, where he did clinic outreach with cerebral palsy and AIDS patients. Rudra: I teach at Integral Yoga Institute in Manhattan’s Greenwich Village. The population is a wide variety of New Yorkers. The regulars in my classes are generally older than your typical yoga student and some have physical difficulties. I like the variety; it challenges me to come up with a unique class each time based on who is attending. Rudra: One time a student told me that after our practice her pain went away. I was taken aback by her comment. It’s wonderful when something like this occurs, but in adaptive and accessible classes as well as in my own practice I’m not trying to ‘fix’ anything or anyone. I hope the physical aspects of yoga and its healing capabilities will be felt, but I realize I can’t go into class expecting a positive result. As a person with accessible needs, I have gained a great reverence for the concept of vairagya, or non-attachment. This concept, from the Yoga Sutras of Patanjali and the teachings of my Guru, Sri Swami Satchidananda, has shaped the way I share my practice: I observe with curiosity, without expecting specific results. My goal is to teach a set of poses that moves the body in different directions so the students feel good enough to meditate. Rudra: Teaching accessible and adaptive yoga seemed to choose me. In my tradition, Integral Yoga founded by Sri Swami Satchidananda, we don’t teach anything, instead, we share our practice and I wanted to share my accessible practice with others like myself. I also teach standard classes where the population is mostly able-bodied, and I’m always struck by how much easier it is to teach “prescribed” poses with limited modifications. These standard classes are the basis for my adaptive class, where I have to formulate a class that works for everyone who attends. I’m inspired by this type of creativity. Rudra: What excites me most is showing up to each class not knowing what to expect. Sometimes a new student arrives and, due to a limitation, I get inspired to offer something I didn’t anticipate like warming up in the chair instead of on the floor. Shifting everything I had intended in order to allow each student to have a beneficial practice is always exciting. Rev. Sam Rudra Swartz is an ordained interfaith minister and certified in Integral Yoga as a Hatha Yoga, Meditation, and Raja Yoga Teacher. He received his Bachelor of Music in Brass Performance, Tuba Concentration from Boston University’s College of Fine Arts Music School in 1996. In 2004, Rabbi Joseph Gelberman from the All-Faiths Seminary in New York City ordained him as an interfaith minister. He holds additional certifications from the Integral Yoga Institutes in Hatha Yoga in 2011, having participated in Integral Yoga Institute of San Francisco’s program called Accessible-Yoga Teacher Training, Meditation Teacher Training from Satchidananda Ashram Yogaville Virginia, and Raja Yoga Teacher Training from IYISF in 2012. In 2016 Reverend Rudra was also ordained into the Integral Yoga Ministry. Additionally, Rudra serves as treasurer on the board of Accessible Yoga.